Wiggles update and where’s everyone gone ? Hi readers all doing well I hope !, it’s a I Wiggles update and where’s everyone gone Kind of article,if you remember last time I did an article on wiggles, she was rather poorly after contracting knuckling on her front paw It does occur in quite a few dogs of the Bulldog breed and I was completely drained both physically and mentally the empathy was superseded by my disorder and I even ended up at the drs and being given a pump for my chest. Bulldogs are not just heavy they are awkward to carry especially if they are like wiggles and act like a spoilt child not wanting to be picked up, wiggles fell in love with our bed and will go to the point she either pretends to be asleep so that you leave her alone or when picked up she makes her body feel like it’s as twice as heavy, I may of explained in my last article that sitting with wiggles in a car going to the vets felt like I was pulling G -Forces. i dreaded each day the vets appointment came round but also knew that wiggles would get pain relief which in turn has a calming effect on me, I’m not making this up I could not eat or sleep and still have a cold left hand that the dr says has arthritis setting in yet it didn’t start until wiggles thought she could learn to fly. 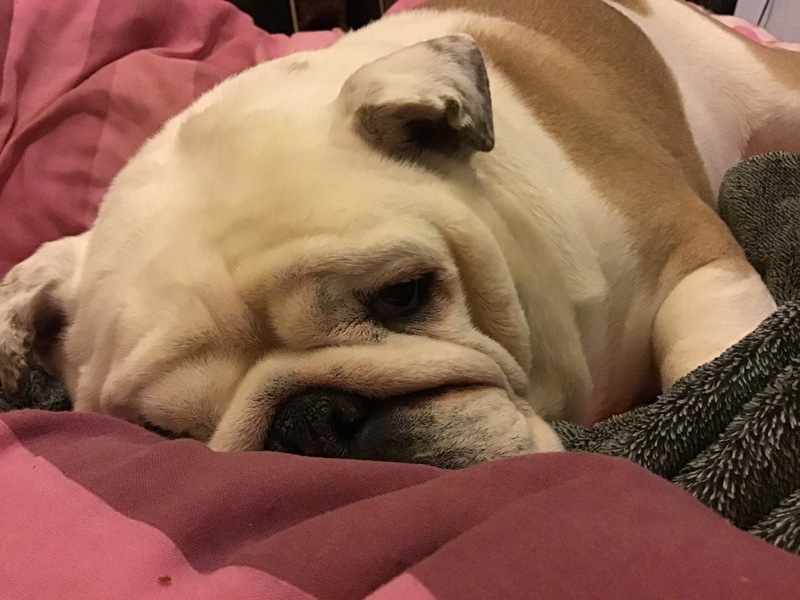 With the vets advice im so happy to announce and I mean it nicely I do not have to carry wiggles down four flights do the car twice and lift her back all the way up the stairs, yes we did pick a rescue bulldog but any dog of any breed can have issues later in life, what’s a shame about wiggles and her poorly paw is apart from that she’s so healthy not many bulldogs sleep all night with face planted into a duvet. wiggles pen has been a god send and helps me to maintain a routine with her it does mean I’m stuck from going in to the front room kitchen and the reason there is when wiggles sees me she goes mad for attention and may catch her paw putting progress back again, she’s now on the mend with a routine I came up with ! Shes in her pen first thing in the morning for breakfast the medication then sends her to sleep and depending on what I’m doing she will either be left to sleep or I bring her though to the bedroom place her on the bed and let her sleep there till her mum comes home, she then stays in her pen till we know she’s done her business on the mats / pads provided and she normally barks either to say excuse me I’ve done a number two or oi come get me. The second part to the article Wiggles update and where’s everyone gone ? is exactly that !!! I remember when I first started I met people from around the world they loved what I was doing and even encouraged some to take up collecting themselves, due to this I created a Facebook group that for a while flourished, but just like the friends I once had it’s died down to nothing now. Im left pondering what I have done to lose my friends there and why my friends and people I know now don’t wish to get involved in what is the only bulldog memorabilia website and all free and paid for too, was it may honesty about my mental disorders did this scare people away, has the collection caused resentment is there so much there I’ve caused people to either think I’m brash or they feel the emotion of jealousy. Emojis on social media posts are cute but we need proper human interactions on the website you may think there’s not much to see but use the search bar and the choice of over 360 articles are at your disposal! YES over 360 original organic articles on a niche so rare there’s no Wikipedia for it. I cannot see those old friends getting back in contact and it’s now down to me to make some important decisions regarding my future online, I pay square one digital £40 a month to run the website £15 is for hosting fees and £25 goes into a fix it kitty where when there’s enough the site will get fixed and the new host has ideas too. Im afraid I have ideas too and they do not include carrying on with Collectibulldogs it’s been ten years now and the support network hasn’t increased there’s no viewer participation and I only have a few core followers that actually share my content yet no one wants to get involved if this is the case why should I keep wasting money on something no one uses. Theres people that know me whom work for bulldog clubs theres breeders show dog owners even other collectors but do they contact us nope not one not even with advice, I do not think I picked the wrong breed to collect it’s just the English nation (most of them) have a problem with bulldogs and there’s no getting round that. Ill be on on the road soon after I’ve collected my bike so that will give me time to think and if I decide I do not want to carry on I will sit down with my daughter and see what she wants to do, will she want to continue the website or even auction off the collection for a car etc, whatever she chooses I’ll be happy with. 360 plus articles,over 1k comments,2 awards, 1 exhibition and some great backlinks so I’m not falling on my sword if I change bulldogs for bikes I’ve achieved so much by myself but I cannot go any further just by myself it would of course be different if the website gained more interest was talked about more and shared about with followers friends using their social media apps to leave us comments, my call to action campaigns were always going to be my downfall.